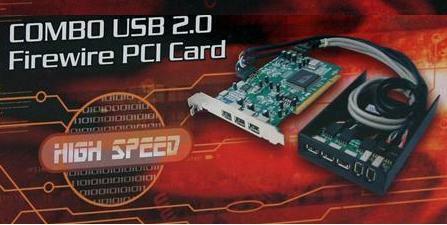 The combo USB2.0+FireWire 1394 card provides both USB 2.0 ports and FireWire ports on a single PCI card. Add three ports to the front panel. Combining these two high speed connectivity technologies on one card/HUB combination saves money and a valuable PCI slot. 3 Ports USB 2.0 and 2 Ports Firewire 1394 combo front bay (optional 5.25" or 3.5') and 3 ports USB 2.0 PCI Card at the back of PC. Provides the most convenient, flexible way to add lots of USB 2.0 & Firewire ports to your computer so you don't have to plug in & unplug devices all the time. Just leave them all plugged in. 400 Mbps data transfer rate for IEEE-1394 (FireWire). Plug & play and Hot Swapping Functions. 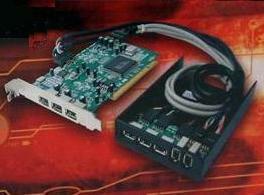 Supports provisions of IEEE1394-1995 for high performance serial bus and the P1394a standard.